Hardly a week goes by without Afghanistan appearing in the media in one way or another. Most recently the focus has been on provinces that are being placed back under the control of the Afghan government, and issues of peace and security are at the forefront. But seldom do we hear about the long-term reconstruction of the country. Both physically and socially, the past few decades have decimated Afghanistan’s social structures – systems that were fragile even to begin with. 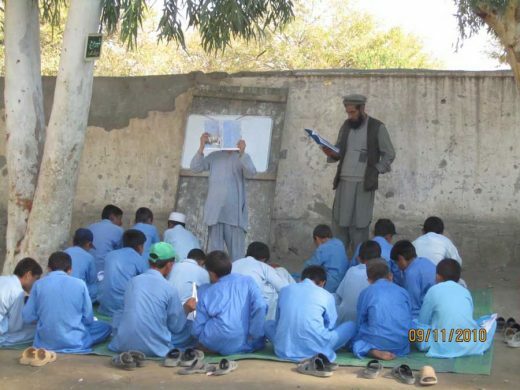 “Handing Afghanistan back to the Afghans” after over a decade of western intervention needs to be about enabling the establishment of viable and sustainable institutions to provide for the welfare of future generations; so where better to start than with schools? In 2010, the Afghan Ministry of Education made a public commitment to construct and equip 6,000 new schools by 2015 – in particular targeting access to education for women with the aim to increase the number of school age girls in education by 20%. According to many estimates however, Afghanistan remains the fourth poorest country in the world – the reliance on outside agencies, both governments and NGOs, should not be over estimated. UNICEF, the World Bank, Save the Children, USAID, DfID and AFD all have extensive programmes in the country, to name but a few. However the Ministry of Education has limited organisational or technical capacity, and the delivery of school construction projects to date has been poorly coordinated and managed. Schools are built to cater for an increased intake of 2 – 3,000 students, while the entire campus continues to rely on ten or twelve pit latrines, probably built before the soviet invasion. In areas of the country that are known to be at high risk of earthquakes, the quality of construction is so poor it’s surprising some school buildings can support their own self-weight, and few have any sort of emergency exit from upper storeys. It is not uncommon to see schools where work has entirely stopped as the contractor has walked away from the site as there is no legal obligation for work to be completed. Yet there are also examples of great schools, well planned, with many child-friendly design features, constructed to a high quality, and often done in partnership with local communities, thus increasing their skill capacity and ensuring their ability to maintain the school once outside agencies have left. What is of particular interest is that there is no correlation between the quality of the project and its cost. Some of best schools have been realised on a budget of a few thousand dollars. Just as many poor projects have cost sheets running into the hundreds of thousands. In autumn last year, Article 25 was appointed by the Danish Ministry of Foreign Affairs to support the Afghan Ministry of Education in identifying the key shortcomings and obstacles to consistent quality in school delivery across the country. The review comprised visits to over sixty schools in Kabul, Herat, Balkh, Parwan and Badakhshan provinces. Members of the Article 25 team met with the Ministry of Education and a number of their implementing partners, including those listed above. The review aimed to gain as broad a picture of the school delivery programme as possible, so the site surveys encompassed design, construction, health and safety, the community’s assessment of the school, and a review of the drawings, contracts and monitoring systems available on site. Back in London, the team analysed data, looking at site photos and completed survey sheets, and scoring the schools from 0 (poor) to 3 (best practice). These scores aimed to identify short-comings common to a number of projects, as well as those projects that performed well on a number of fronts. By examining the failures common to many projects, the review was able to identify the root causes for many of these, and make simple recommendations for improvements. Schools that did not perform well were those that lacked a child-friendly approach in their design and often failed to provide a safe environment for those attending classes due to poor quality of construction and failure to incorporate basic safety measures. The projects that were found to have performed best were smaller in scale and generally bespoke designs rather than the government’s standard design. In these cases, the implementing partners had made efforts to engage the local community in the design and construction process and used a higher proportion of locally sourced materials, thereby achieving a better level of investment in the Afghan economy and improved value for money. Mostly surprisingly, the review found that many implementing partners had not carried out impact assessments prior to commencing a project. While most schools did cater for a genuine need, in certain cases, it was found that donor money would have been put to better use training and employing more teachers for an existing school, or locating the school on a different site. Improvements to the government standard school design and the Ministry of Education’s preferred procurement and delivery routes were also found to be needed. Article 25 presented all of these findings to a number of different agencies working in Afghanistan in June this year and are now developing a partnership with them to improve the organisational and technical capacity of those involved in the school construction programme. This will ensure improved and more efficient routes for school delivery and, ultimately, better schools for hundreds of thousands of children across Afghanistan. This building has been shortlisted for the Aga Khan Award for Architecture in 2013.